Fran advised that the Apple and Grape Committee had not contacted her re the article in the Border Post about the Busking competition which she had understood was to be cancelled for this year. 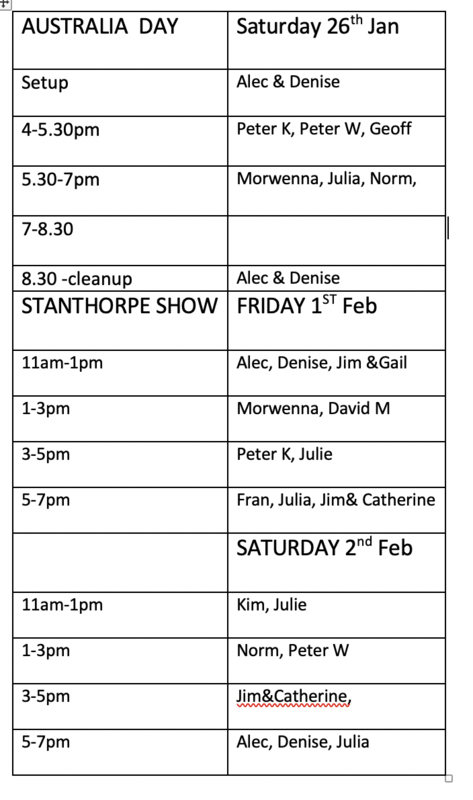 I am attaching a roster drawn up after the meeting last Monday for helpers at both the Australia Day barbecue and the Stanthorpe Show. Alec had thought that Australia Day in the Park was from 4-6 but it is actually 4-9pm, so the roster has increased the time slots to 1.5 hours so please check your new time slot and let Alec know if you need a change. This also means we need more helpers in the later time slot which was not offered when he circulated the roster. Also please note that the Show Society do not offer volunteers a free entry pass so you have to either take out membership of the society or pay normal entry at the gate. More helpers are welcome in all time slots. 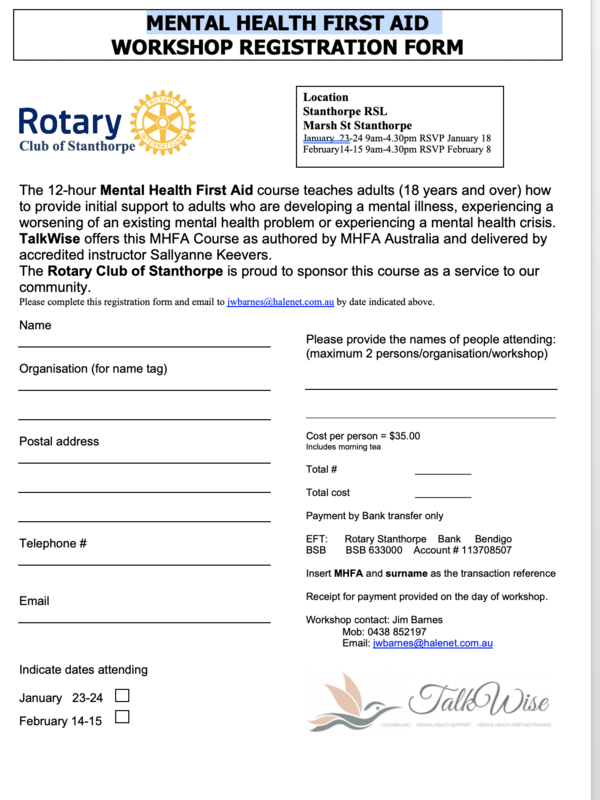 Also Jim advises that the January Mental Health workshop is now full, but there are still positions available in February. 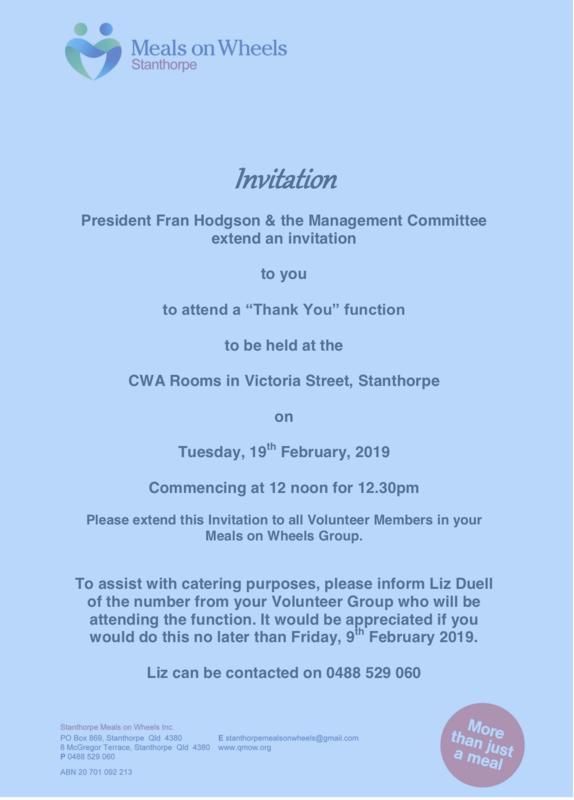 Next Monday we have Assembly and a reminder that committee Chairs are expected to provide both a written and verbal report of the first 6 months for this meeting. Please advise Kim if you have agenda items for Monday's meeting.